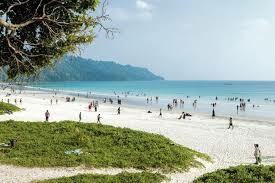 Start after Arrival at Port Blair int he Morning by flight / Ship and transfer to hotel. After freshen up start a tour of places in and around Port Blair (City Tour) covering famous places like Cellular Jail. In the evening, attend the enthralling Sound and Light show at Cellular Jail – Where the heroic saga of the Indian freedom struggle is brought alive. Morning after breakfast departure by inter-island ferry to Havelock Island (57 kms by sea from Port Blair) + Visit to Radhanagar Beach at Havelock Island (Best Beach in Asia by Time Magazine-2007- and also Declared countries Best beach Announced by Tourism Dept of India), Stay overnight amongst sandy beach and lush green forest in a comfortable beach resort. After breakfast transfer to Havelock Ilsand Jetty. Visit Elephant Beach in a Speed sharing boat, the travel time is around 45 Min to reach Elephant Beach.This beach has one of the best coral reefs in the world & the under marine life is very lively & Colourful,Snorkeling shall be proivided for the couple out here. Please do not forget to take snacks for the trip and lots of drinking water & changing dress for the day trip or advised, Overnight stay at Havelock Island. Airport Pick up & Drop is complimentary from the company side.